After nearly a year of sipping old favorites, exploring new avenues, achieving many breakthroughs and receiving random packages of amazing teas with a request for review, I have managed to identify my favorite teas of the year. 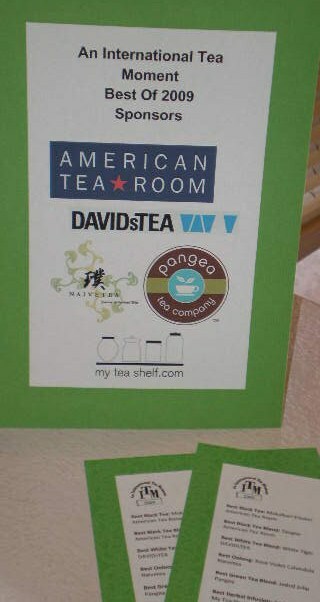 It is my distinct pleasure to announce An International Tea Moment’s picks for The Best Tea of 2009! Congratulations to all the Award Winners for 2009. And thank you to all my readers who have provided an overwhelming response to the drawing! I’ll be announcing the drawing winner tomorrow! Awesome and what a great honor to the companies. Your event sounds really profesionally organized! I would like to taste all of them…. but I am too far away. So I’ll continue on reading your lovely blog! How fun! I hope the event was a hit! I’ll have to give some your top picks a try! It went better than I could have hoped for! Stay tuned for the full story tomorrow! What an awesome idea! Yet another reason to wish I lived down south… Sounds like a lot of fun with tons of wonderful tea (and the perfect day to be inside with friends!) I’m looking forward to trying the winning green tea blend!